Native of Asia, eastern Europe, and the Indian subcontinent. Introduced and naturalized in North America. Prairies, roadsides, parks, farm shelterbelts. This is a moderate- to fast-growing, short-lived, deciduous, large shrub or small tree rising on a single stem. In Minnesota mature trees are usually 15′ to 20′ tall and up to 6″ in diameter at breast height, though large individuals can reach over 30′ in height. 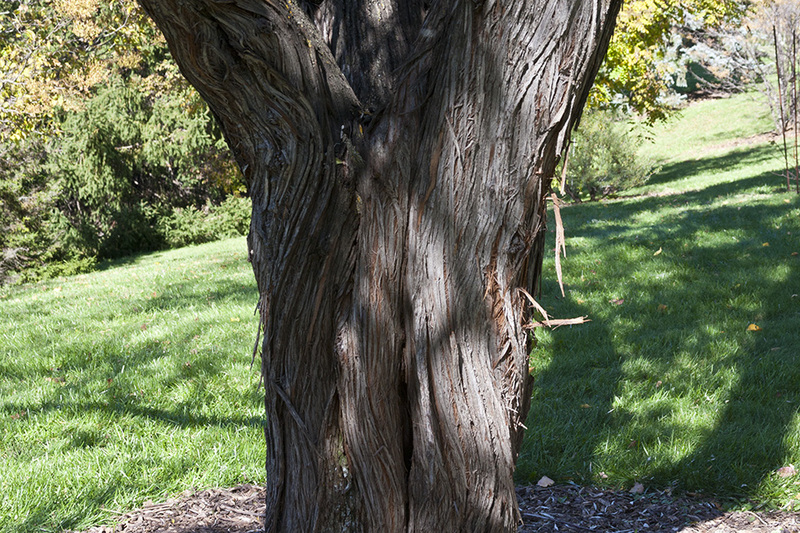 The trunk is often crooked or leaning. The crown is low, open, and rounded. The branches are erect. 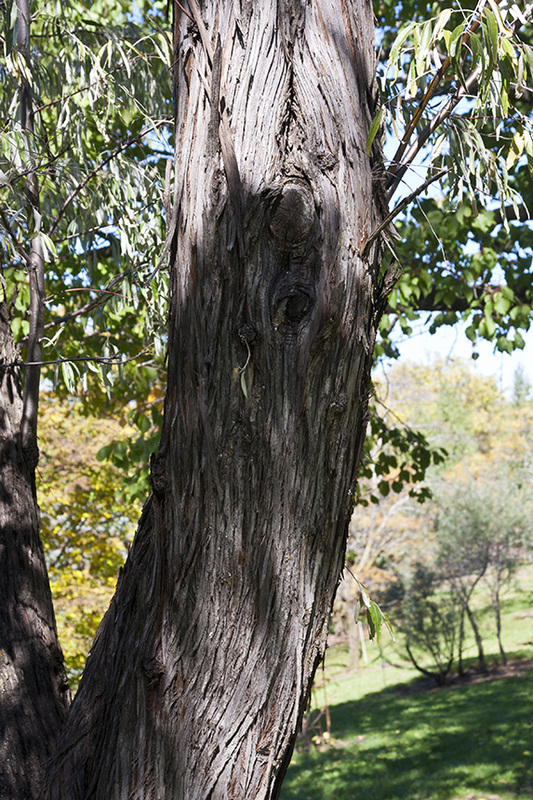 The bark on young trees is smooth and gray. On mature trees the bark is reddish-brown or purplish-gray. It is shallowly furrowed with orangish fissures that often spiral around the trunk. It sometimes peels in thin strips. First year twigs are densely covered with silvery scales and sometimes also with star-shaped hairs. Second-year twigs are hairless, shiny, brown to reddish-brown, and thorny. They have white pith that is finely chambered, at least below the buds. The leaf scars show a single, extended vein. The buds are small and egg-shaped with 4 overlapping scales. 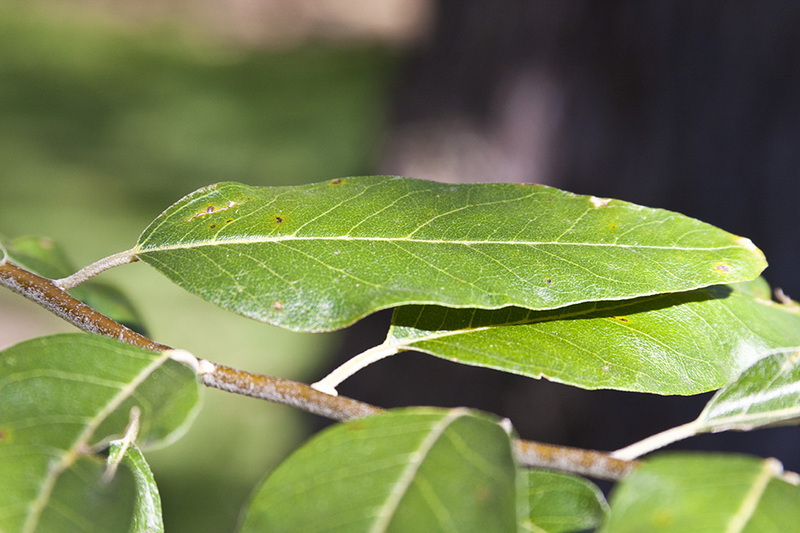 The leaves are deciduous, alternate, narrowly lance-shaped, 1½″ to 3″ long, and ⅜″ to ¾″ wide. They are on ⅛″ to 7 ⁄16″ long, scaly or hairy leaf stalks. The leaf blades taper to a point at the tip and are usually tapered, sometimes rounded at the base. The upper surface is dull grayish-green and may be sparsely to densely covered with silvery scales. The lower surface is densely covered with silvery scales. When young both the upper and lower surfaces are silvery white and densely covered with scales and star-shaped hairs. The margins are untoothed. The inflorescence is a cluster of 1 to 3 flowers rising from the leaf axils near the base of current-year twigs. 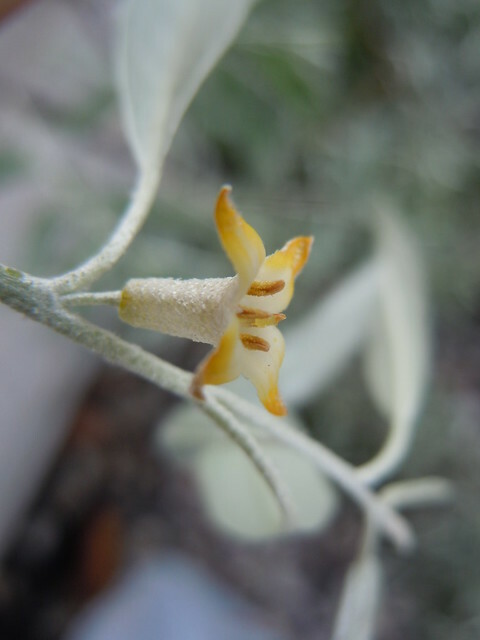 The flowers are 5 ⁄16″ to ½″ long and perfect (have both male and female parts). The 4 sepals are fused at the base into a bell-shaped tube, then separated into 4 triangular, spreading lobes. They are yellow on the inside, and silvery on the outside. There are no petals. The flowers appear in early June to early July. The fruit is an oval, ⅜″ to ½″ long, dry, mealy drupe. It is yellowish-brown but appears silvery when young due to a dense covering of scales. The fruit ripens in mid-August to mid-September and is dispersed by birds and other animals. The pit is oblong. 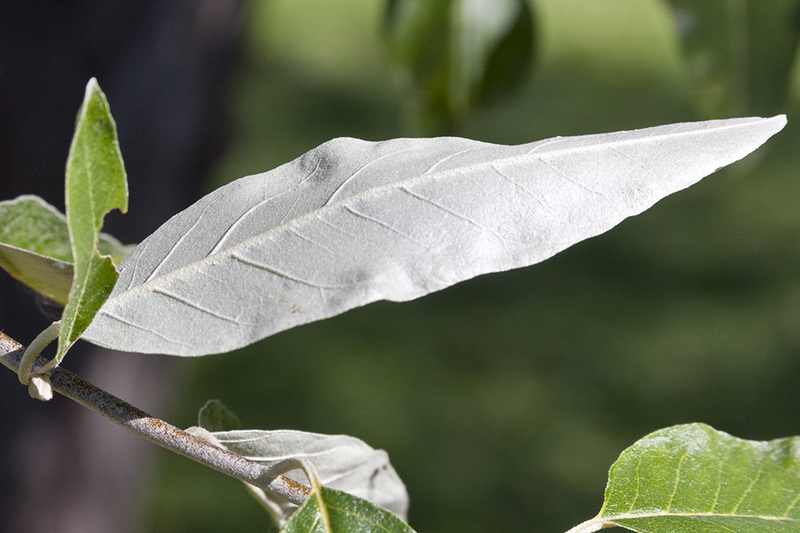 Autumn Olive (Elaeagnus umbellata) leaves and twigs have rusty brown, not silvery, scales. Its range may not extend into Minnesota. Introduced tree to 8 m tall, sometimes a shrub, the usually silvery twigs and narrow leaves distinguish this introduced species from the closely related native E. commutata, cultivated but often establishing in woodlands, thickets, and riparian areas in Montana especially in and around towns and agricultural areas (nutrient rich riparian areas). Russian Olives are fast growing, nondescriminant, non-native trees found in Wyoming. 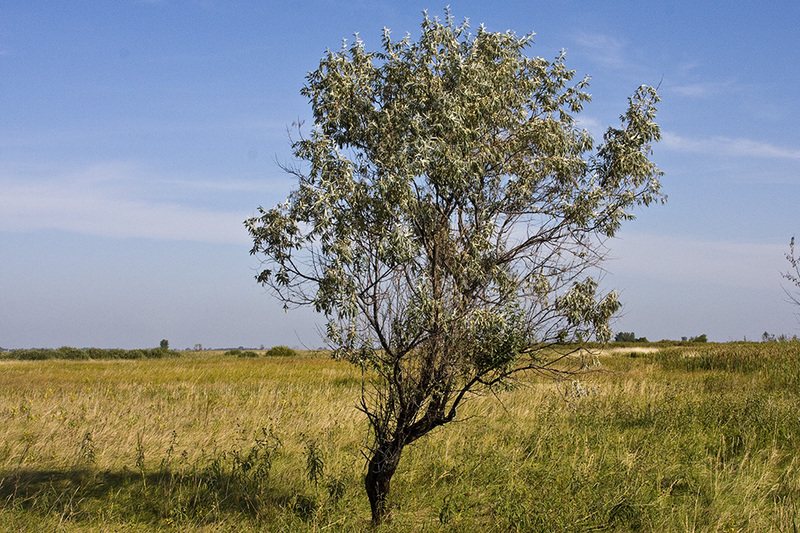 Olive Russian or Elaeagnus angustifolia is an excellent windbreak and wildlife tree. It is extremely tolerant of environmental factors. The best windbreak tree for high wind areas. 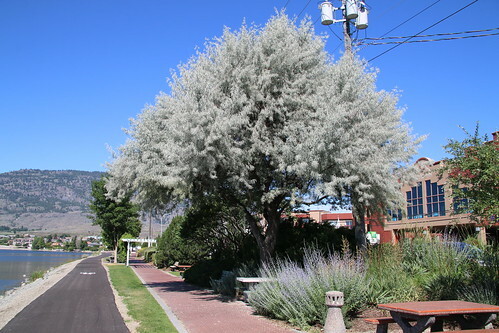 Pictured is the Russian olive in a shrub form. Can be made into a hedge by planting 10' apart in the row. 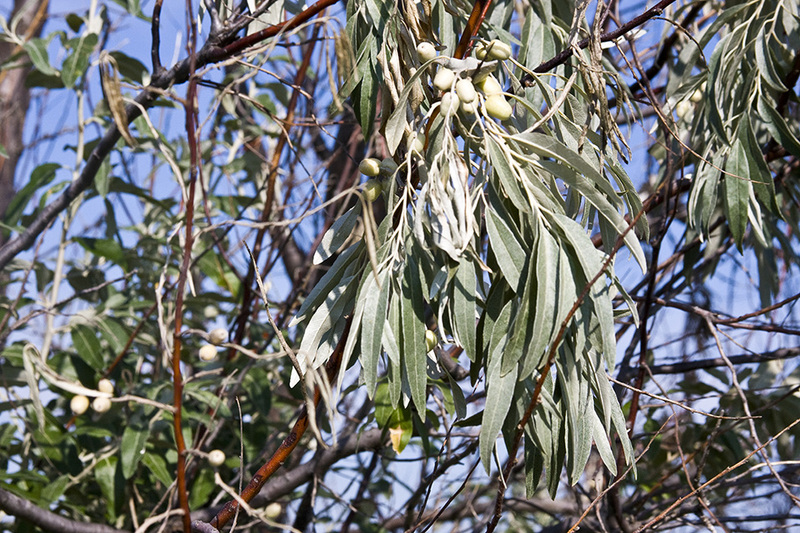 Russian olive is low in water requirements and displays a high tolerance for salt and alkali. Many russian olive plants have been planted for wild turkey and deer as a wildlife food source.